After being on this earth for fifty years I have come to realize what I can and can't do. It has taken a lot of trial and error but there are certain jobs around the house I simply can't do. God has gifted me with me with many talents but one that is not on the list is car mechanic. Lord knows I've tried, I've fumbled through replacing water pumps and starters, head gaskets, brake pads, thermostats and numerous other parts I couldn't point out on a drawing, only to ask myself, "what am I doing?" Every once in a while someone comes in the store where I work needing help and it soon becomes obvious they have no clue what they are doing and should pay to have someone do the work for them. That's me and cars! The other day the "check engine oil" light came on in my truck,"oops that's not good", I thought, but at the same time I'm thinking "oh no, more car work". 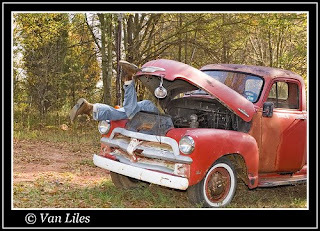 As I lay there under the truck the next day it came to me, this is as in depth as I want to get with automobiles, from now on changing oil is as far as it goes, period. Oh yea, one more thing, my truck has been smelling hot up front, is that bad? Don't worry. I am the same way. I think I realized that when I broke the bolt off that solenoid and we rigged something up. I guess that's why we have Aaron around. The picture is so funny! I knew before I read your post that it was going to have some humor in it. Hi this is Aaron. Just tell me when you want it looked at and we can diagnose whats going on,but the first thing we must do is confirm the customers complaint. What does hot smell like? Just kidding. But really call me and I can take a look. I haven't visited for a while, I liked your word post from Oct. You are a deep thinker indeed. Maybe you should forget the cars and just think.